Ever have one of those days where you just don’t feel like cooking? I love cooking, and I still have those days (a lot of them actually) where I just don’t feel like doing it. So for all of us who feel this way (whether it’s everyday or every once in a while) I put together a cookbook with recipes designed to come together quick, and take the pressure out of cooking. 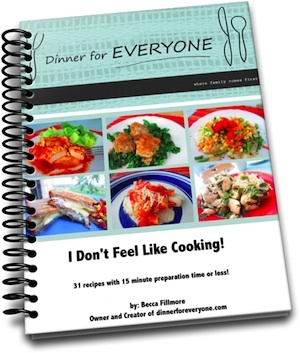 What will you find in Dinner For Everyone’s “I Don’t Feel Like Cooking” cookbook? 31 recipes to cover a whole month of “I don’t feel like cooking” days! Includes opinions and suggestions from people like you about how the meals worked for them and their families. SATISFACTION GUARANTEED!!! If you are not satisfied with the cookbook and what it has to offer in 31 days (enough time to try every recipe if you want) then take advantage of our money back guarantee!